The keycam may have failed, example here, the latest design keycam can be easily identified as the colored changed to black. Replace either the keycam or chassis as needed to resolve this issue. 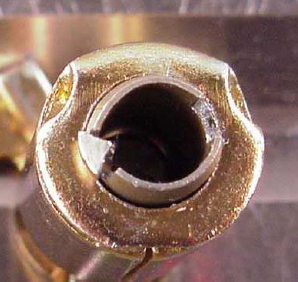 This could also happen if the tailpiece isn't installed in a KIL, FSIC, or SFIC cylinder. The FSIC driver also could have come loose from the core in the spindle. Do we have Silver finish keys in Schlage?